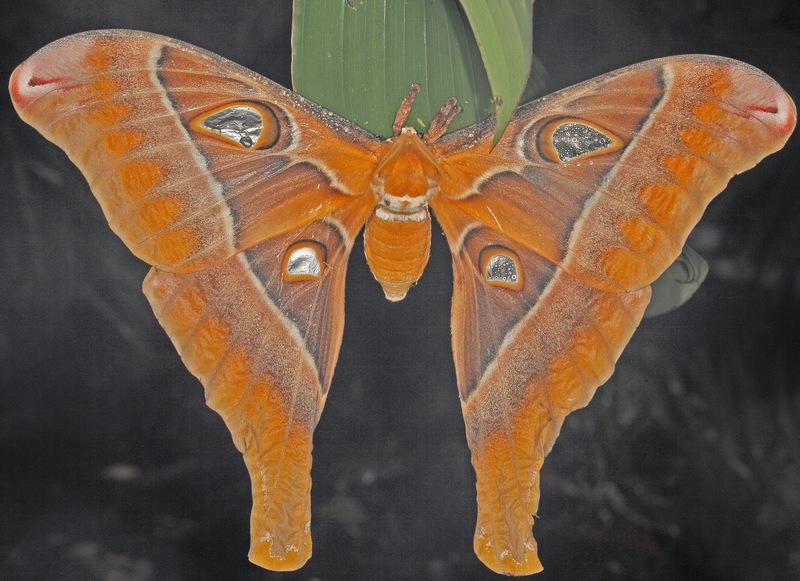 The Hercules Moth, Coscinocera hercules, could be the largest moth in the world. It depends on how you make the measurements. Not to worry; it is indeed the largest moth in Australia. For the past few days since the drought broke and we have been having heavy rain and wind, Hercules have been showing up at the light. It is not unusual to find males clinging to adjacent vegetation throughout the year but to find a female, and one in perfect condition, is a bit unusual. Females are larger than the males, have more robust bodies and have shorter antennae. In addition they have shorter "tails" on the hind wings. Adding to the interest two females showed up on consecutive nights. Hercules moth caterpillars feed on a number of trees in our area. The Bleeding Heart, Omalanthus nutans, is a common host and we have several on the property. Readers can increase the chances of Hercules moths breeding in their area by planting Bleeding Heart tree. This specimen measured 21.6 cm across the top of the forewings. Who Said Cockroaches Are Not Colourful! On a recent trip with some James Cook University students, a few remarked that they had no idea tht cockroaches could be so colourful. "offer" what they are looking for! 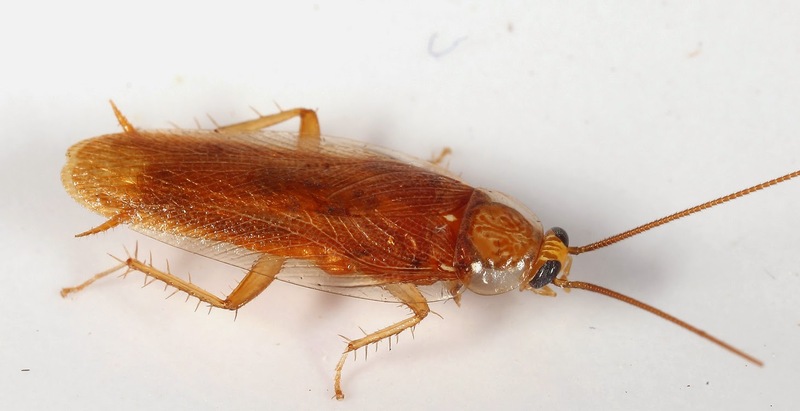 This one, the Inland Ellipsidion, Ellipsidion amplum Hebard literally flew into me while I was walking on a Cairns street in the centre of town. It is a diurnal species that lives on flowers where it feeds on pollen and nectar. The bright orange colour pattern suggests Mullerian Mimicry. The Inland Ellipsidion Ellipsidion amplum Hebard, dorsal and ventral views. Ellipsidon cockroaches are fairly common across the continent where they have a rather similar appearance. This is among the largest of species measuring 17 mm. The above-noted specimen was a bit battered after being carried around in a shopping bag for a few hours. Here is an example of the species in much better condition. 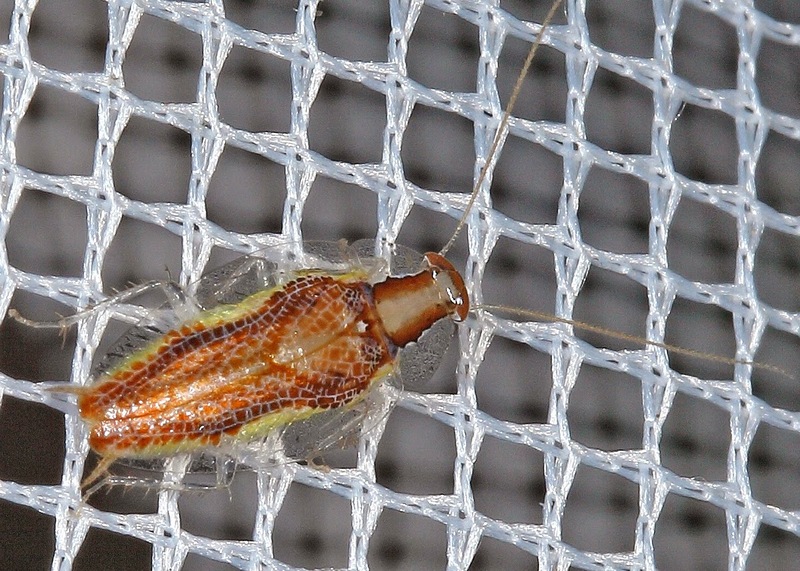 Note the orange-tipped antennae. Other species have the antennae with white tips. In addition, the antennae are very hairy (click on the photo to enlarge), a condition quite unusual in most Australian cockroaches. Ellipsidion is a member of the large family Ectobiidae (formerly Blattellidae) and is in the subfamily Pseudophyllodromiinae. This is quite a mouthful. However, species in this subfamily are usually very attractive. Here are a few examples. The Australian Allacta, Allacta australiensis Roth. This species lives in rainforests where it can be found only on tree trunks. It seems to prefer certain trees and not others. It measures 11 mm and is active at night. 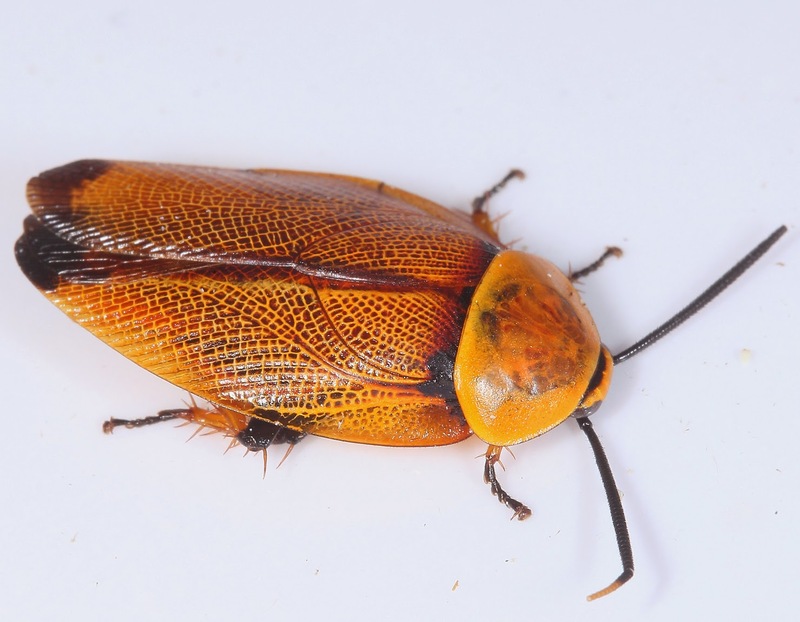 Pseudobaltas are tropical cockroaches that are active at night. They have been found under bark during the day. The species has a broad distribution across the continent and the markings on the thorax (pronotum) are variable. It is small, measuring about 6 mm in length. The genus Balta includes some 39 described species in Australia. There are many undescribed species, like the one above. Baltas are distinguished on the basis of colour and morphological structures. They are nocturnal and live in leaf litter during the day. Their numbers are often great and they probably serve as food for many other organisms. All known species are active after dark. The Pretty Balta, Balta verticalis Hebard. This Balta is aptly named. The specific name refers to the stripes between the eyes. It is a fairly common tropical species in northeast Australia where it can be found in rainforests and along rainforest margins. It measures about 12 mm in length. One of the commonest Baltas in the northern Tropics, this species spends the day in leaf litter and is active at night. It frequently comes to lights. 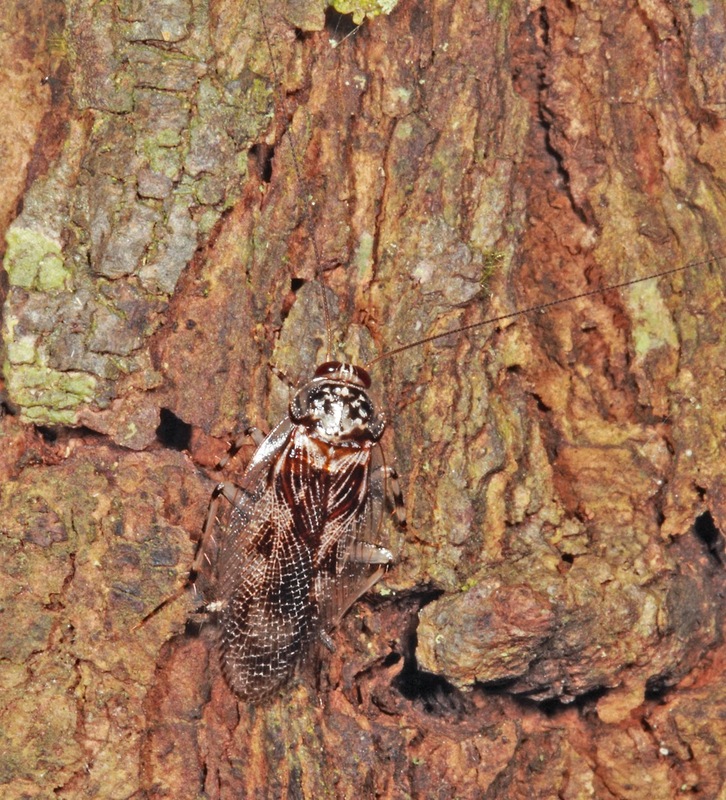 The pattern on the pronotum and greyish colour is very characteristic. Mediastinias are more common than previously thought. They are very small, measuring less than 5mm in total body length. They are very colourful and have a very flattened appearance. This facilitates diurnal life in leaf axils and unfurling leaves. After dark they emerge to feed on particulate matter found on leaf surfaces. 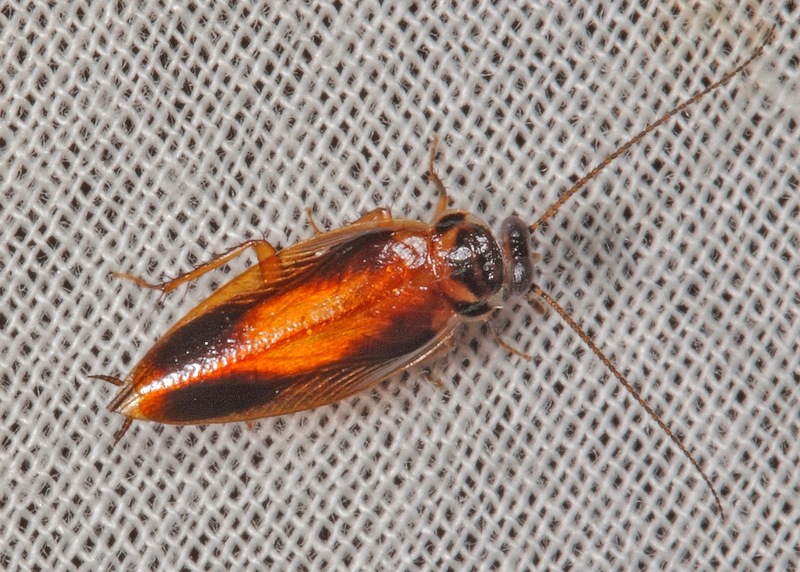 This cockroach is another nocturnal species but it belongs to another ectobiid subfamily, the Ectobiinae. Seldom seen during the day, adults can be attracted to light late in the evening. This species has a number of different morphs based on the pattern of the pronotum and wings. They are small, measuring less than 5 mm in total length. 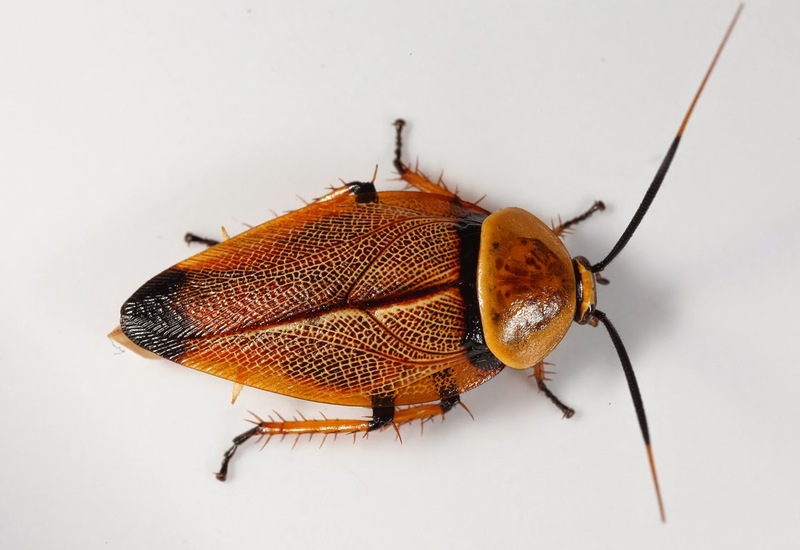 Sloane's Northern Wingless Cockroach, Cosmozosteria sloanei Shaw. 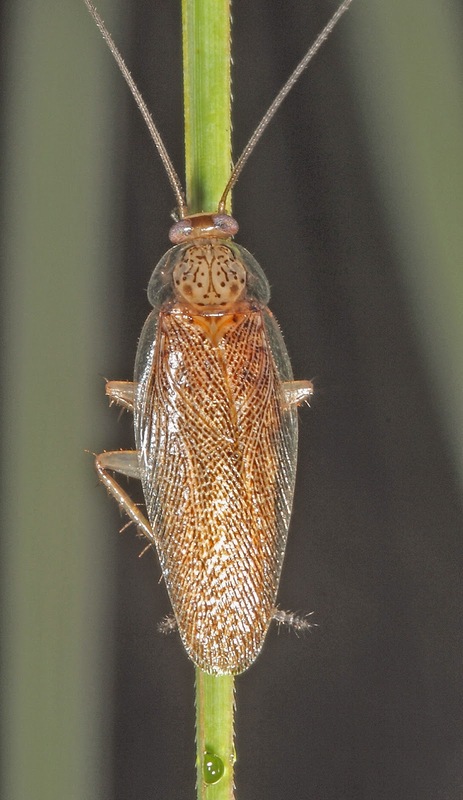 This is an example of the most characteristic group of Australian Cockroaches, the subfamily Polyzosteriinae of the Blattidae. 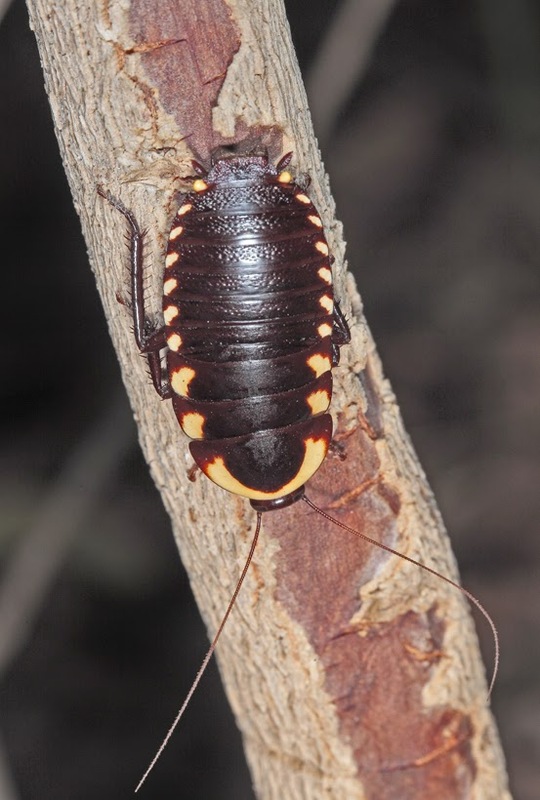 Everyone who has wandered around in the outback or the mixed woodlands of the tropics has come across these large cockroaches abroad during the day. They are very conspicuous in their colour patterns and they seem to be walking bags of nasty chemicals. They are avoided by birds and lizards. This one is about the size of a 20 cent Australian coin. But these insects are the topic of a future blog. 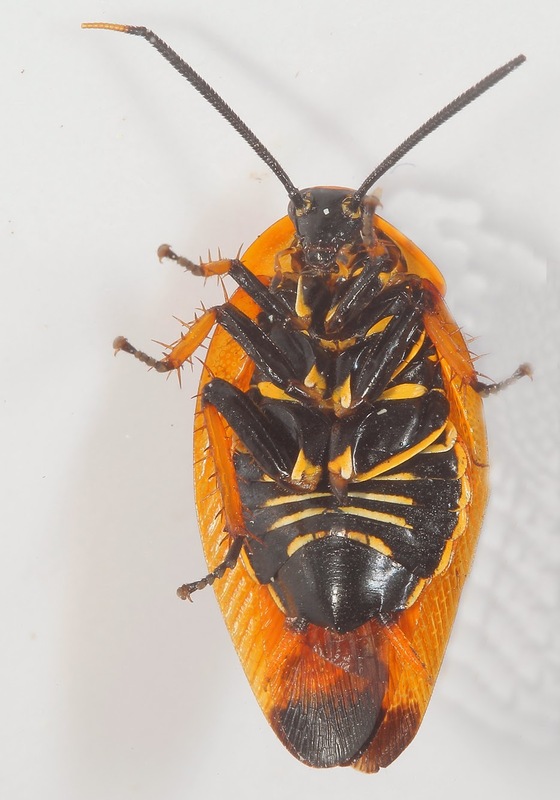 Labels: Australian cockroaches, colourful Australian cockroaches. 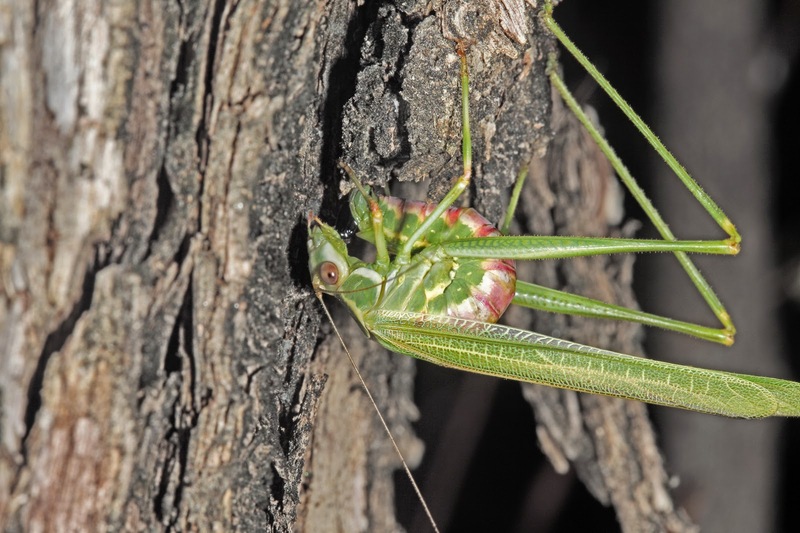 My friend Martyn Robinson at the Australian Museum in Sydney noted that in the previous blog I should have recalled an observation that he made a couple of years ago on the Superb Katydid, Alectoria superba Brunner. This is a relatively widespread katydid of arid and semi-arid portions of the Australian continent. The Superb Katydid, Alectoria superba Brunner, male. This katydid is in the Phaneropterinae, the same subfamily as Polichne, the subject aforementioned blog but it is unrelated. It is characterised by the peculiar roof-like development of the pronotum. Martyn discovered that the species lays its eggs singly on branches and covered them with chewed bits of bark. A small branch with a covered egg of A. superba. The ends of the eggs are delimited by the lines. 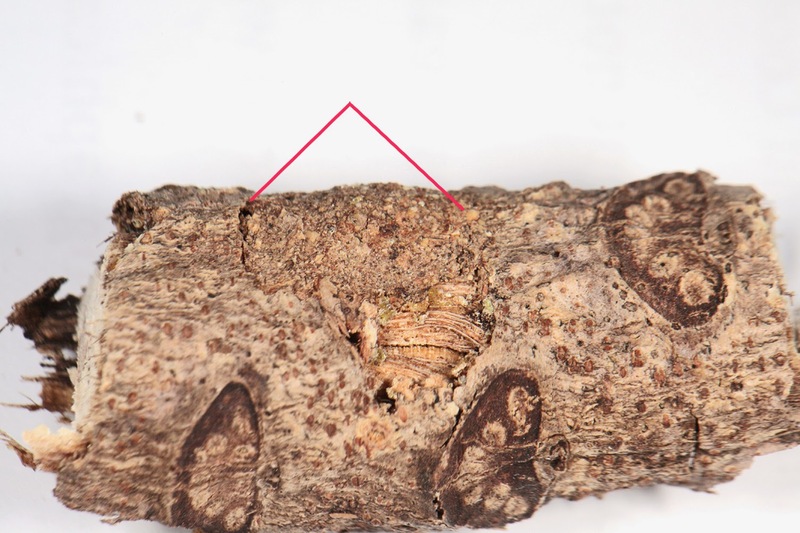 The little patch of missing bark may have been used by the katydid to cover the egg. The crescentic marks are leaf scales. Thanks to Martyn for pointing this out. It is even more embarassing that the twig sits on my desk just a few inches from my microscope and I see it every day! Ah, the exigencies of age! 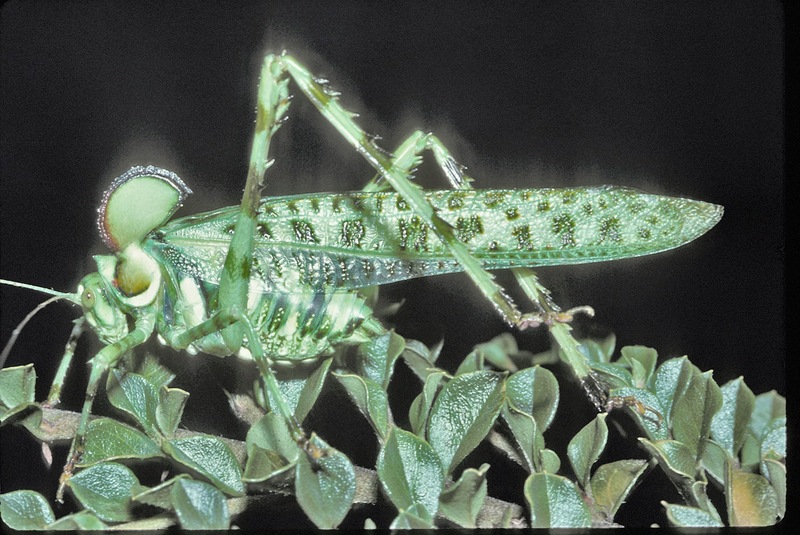 Katydids have figured prominently in research concerning male/female relationships, sexual selection, communication, and other areas of insect behaviour. Parental care has been demonstrated in a few species. 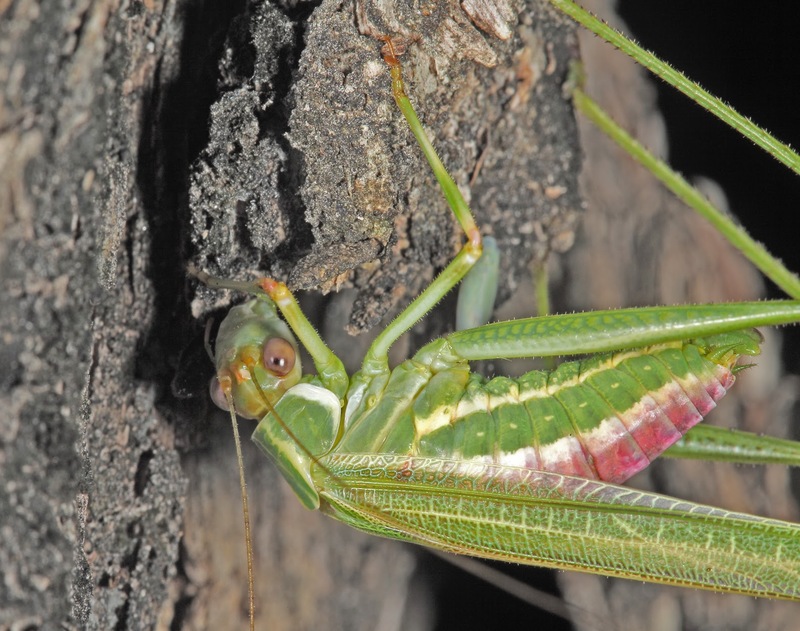 Here I report on the concealment of eggs by a female katydid. The observation was made at Talaroo Station, west of Mt Surprise, Queensland. Of course, the mere act of laying eggs (oviposition) in katydids is an example of parental care to some degree. 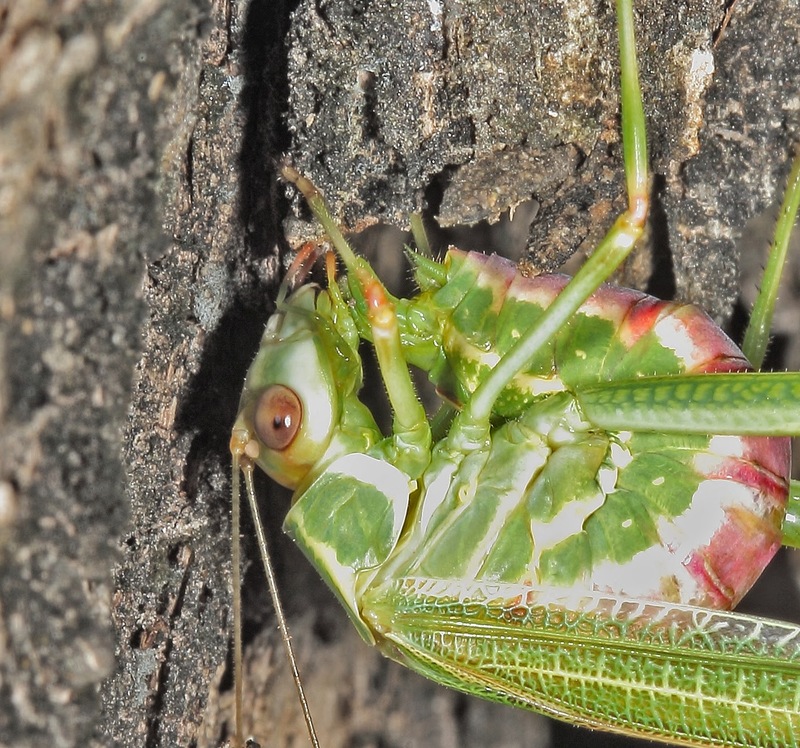 Katydids lay eggs in the ground, in leaf tissue, in wood and other media. But coating the egg with an external substance is unusual. 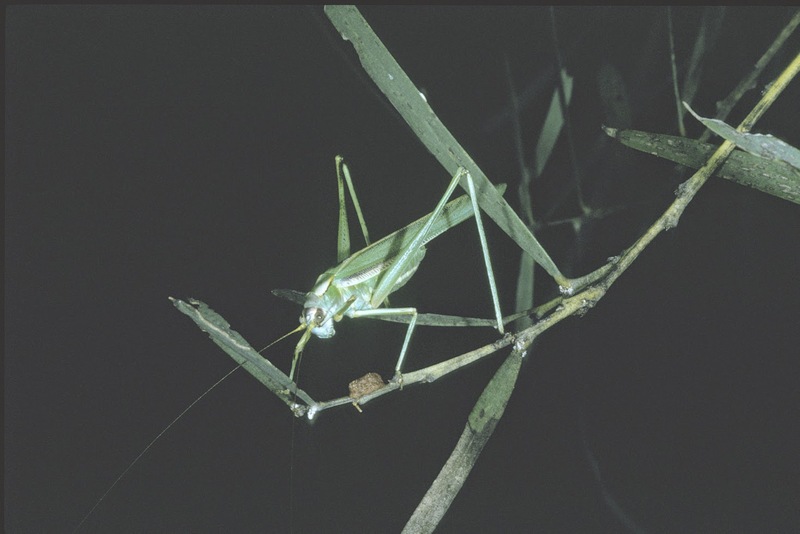 In the Guide to the Katydids of Australia (Rentz, 2010: 170) I noted a female Polichne argentata that had just completed laying an egg on a twig and then covering it with a bit of dirt that it had gathered from the ground beneath. 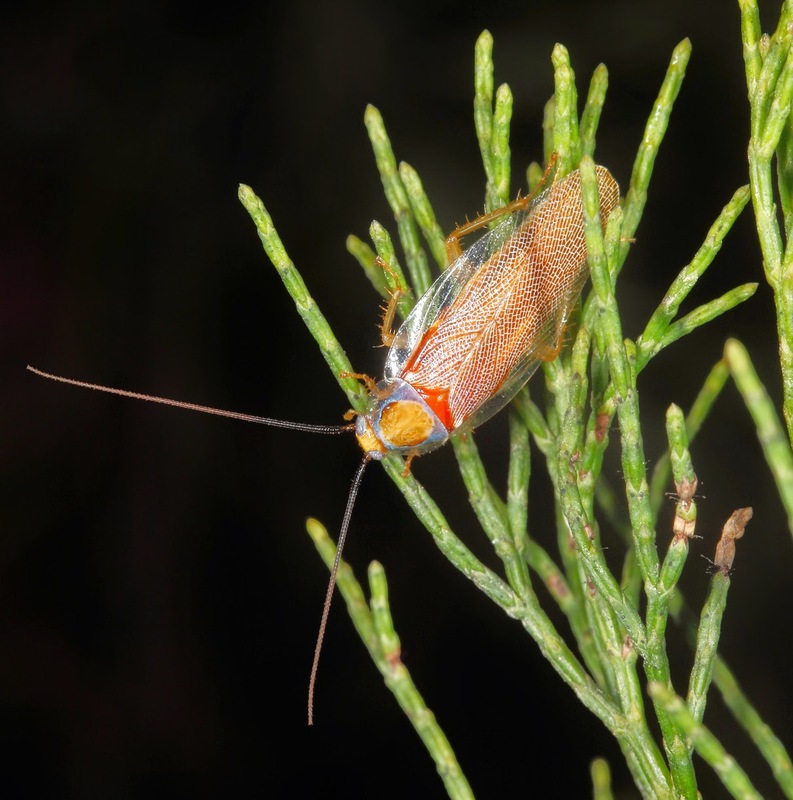 Recently I made a similar observation on another, probably undescribed, species of Polichne. I was fortunate to have my camera at the ready and was able to record most of the event. 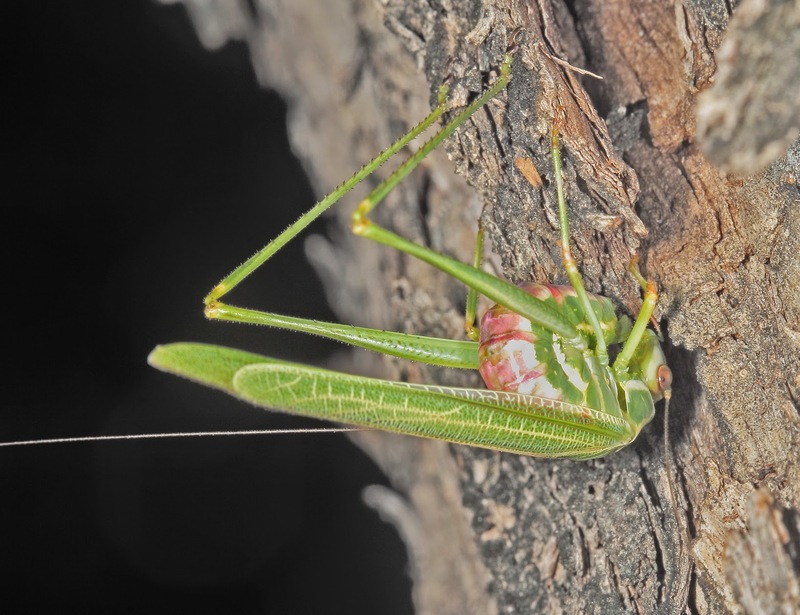 In this observation, the katydid first chewed a piece of bark from a eucalypt. Then it guides its egg into the selected crack in the bark of the tree. The final act of plastering the egg with the chewed bark it had gathered just prior to oviposition. So what is the "reason" for the unusual ovipositional strategy? Covering the egg with a foreign substance may aid in reducing desiccation in the normally dry habitat of the Australian outback. It may also afford some protection from minute hymenopterous egg parasites. Or it may be none of these explanations. It seems less likely that it obscures the egg from potential vertebrate predators. Rentz, DCF 2010. 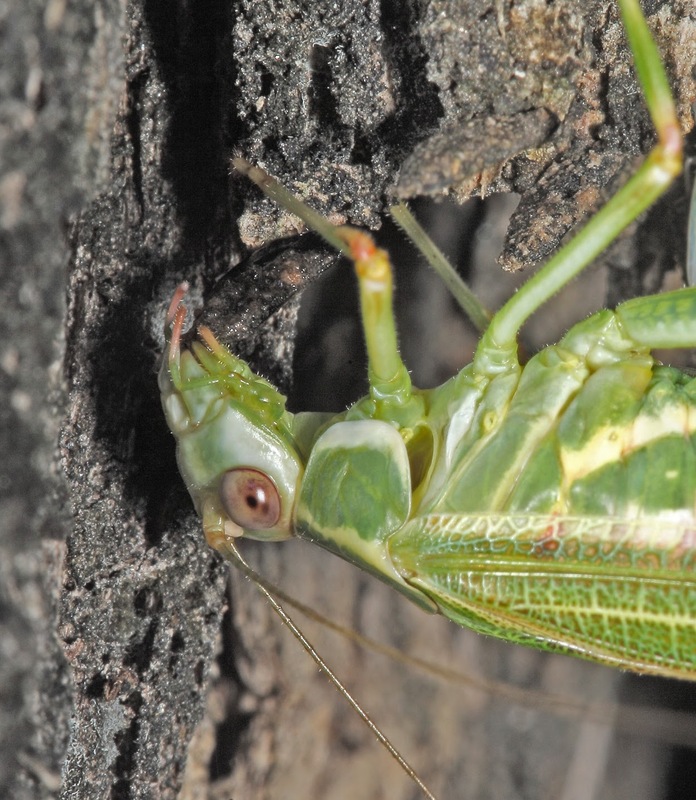 A Guide to the Katydids of Australia. CSIRO Publications, Pp. 1-214. CSIRO Publishing, Collingwood, Vic.